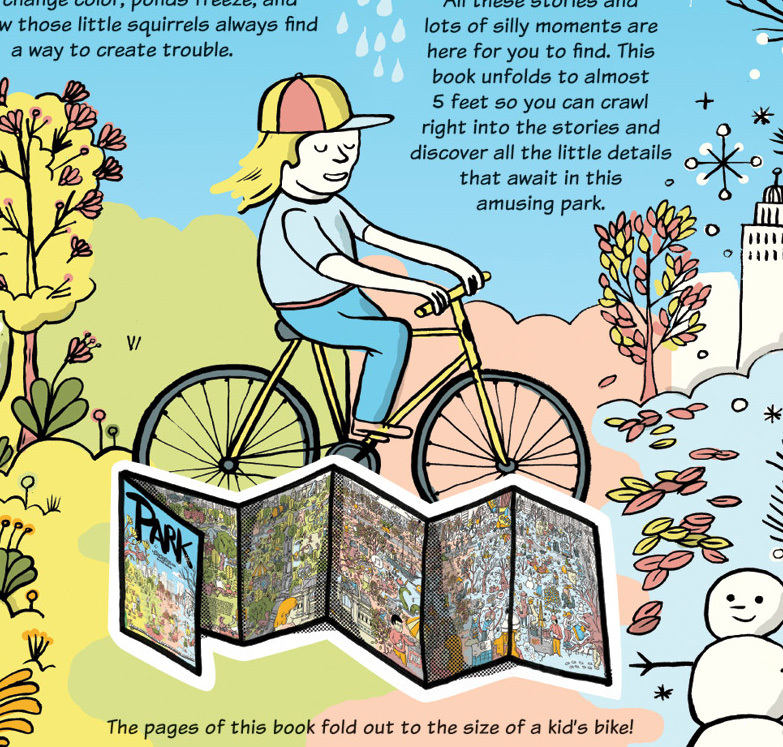 This fall my favorite publisher duopress is rolling out a cool new project: PARK: A Fold-Out Book in Four Seasons. PARK is an oversized book with an accordian-fold interior that extends to almost five feet in length. duopress’s goal for PARK was twofold: 1) Celebrate the beauty of Central Park, which represents city parks in general, and 2) Take full advantage of the uniqueness of the fold-out. We envisioned an abstracted, exploded view of the Central Park stretching across the five-foot spread, with the seasons evolving from left to right to show the passage of time—something that couldn’t be done as fluidly in a traditional book. 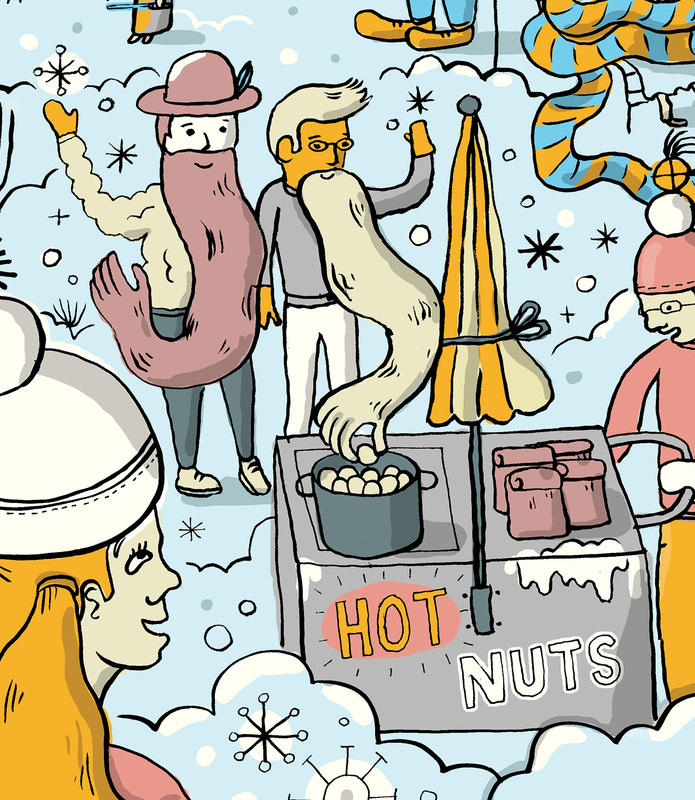 Additionally, we decided to fill the park with characters whose stories develop as the seasons evolve. For example, we meet a pair of hipsters in the spring on the left. As we see them in the summer and fall their beards are longer and longer until, in their final appearance in winter on the far right of the book, they actually come alive. The next challenge was finding the perfect illustrator and designer for the job. 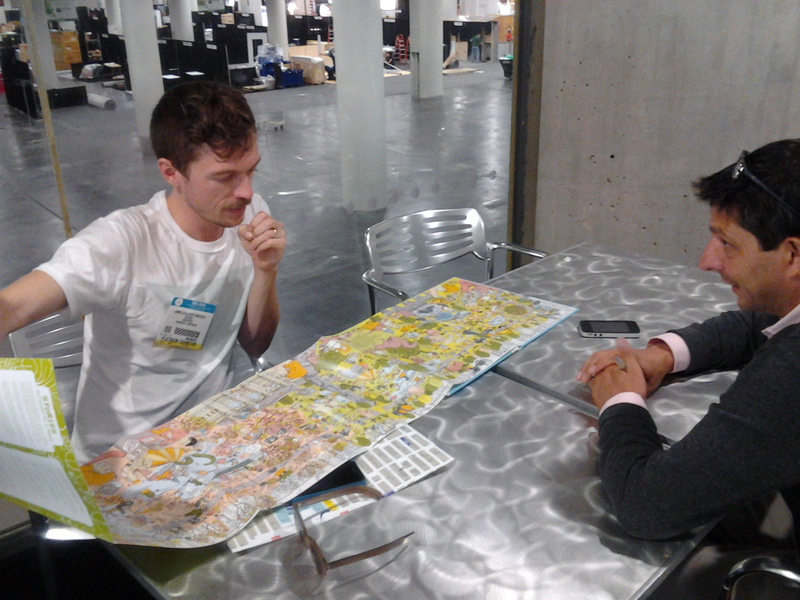 In early 2014, riding waves of success from his blog-turned-book All The Buildings in New York (Universe Publishing/2013), James Gulliver Hancock signed on to illustrate PARK. 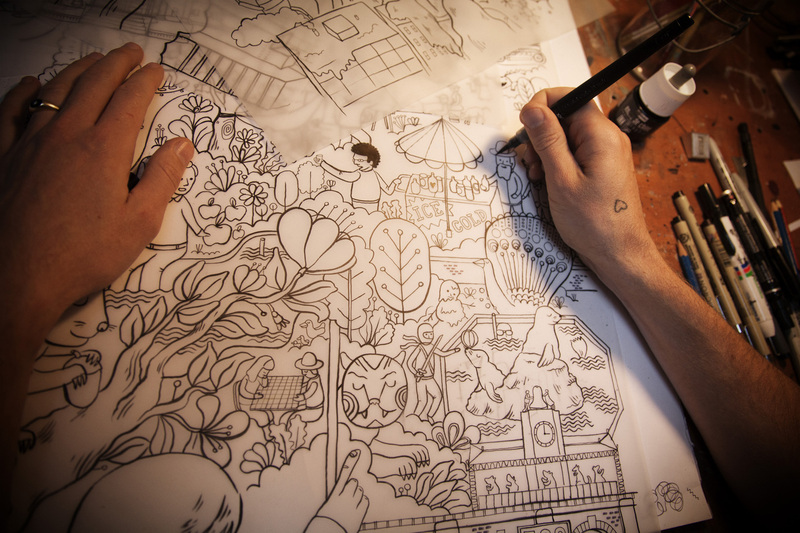 James, a globetrotting Aussie and part-time resident of Brooklyn, NY, created all of the art from his home in Sydney. PARK was a dream project for me! To draw Central Park, an icon of New York City, and play with a whole bunch of quirky characters through the seasons would be so much fun. I also loved that duopress was up for doing a different kind of production in the form of the fold out and the large scale. The drawing on the back cover of the kid on the bicycle showing how big the book is really sums up the playfulness that I loved about the project from the beginning. 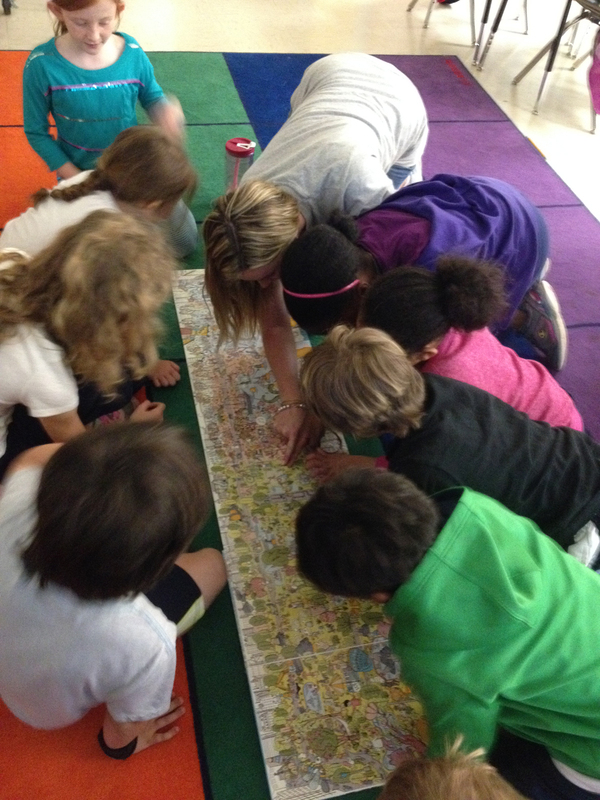 And which kid didn’t love Where’s Waldo? it was a dream to be able to make my own take on that style of project. Also having lived in New York through the seasons, it was so fun to represent some of my experiences through the seasons—because the weather in each season is so graphic and obvious in the northern hemisphere. It was fun to do really rough sketches at the beginning, basically just circles for placement, then build that up to a second sketch and then take it all the way to final. I had to draw quite large to get all the detail in there, so there was quite a lot of collaging together of drawings to make the huge final. It was always a matter of zooming in and out to get a sense for it on the computer as it came together, but there was nothing like the moment when I saw it produced in all it’s finished glory! From her studio in Toronto, free-lancer Beatriz Juarez joined the team to design the book, including the title type treatment, which she created by hand. I start with a blank page and sketch the title in as many styles as possible with markers. 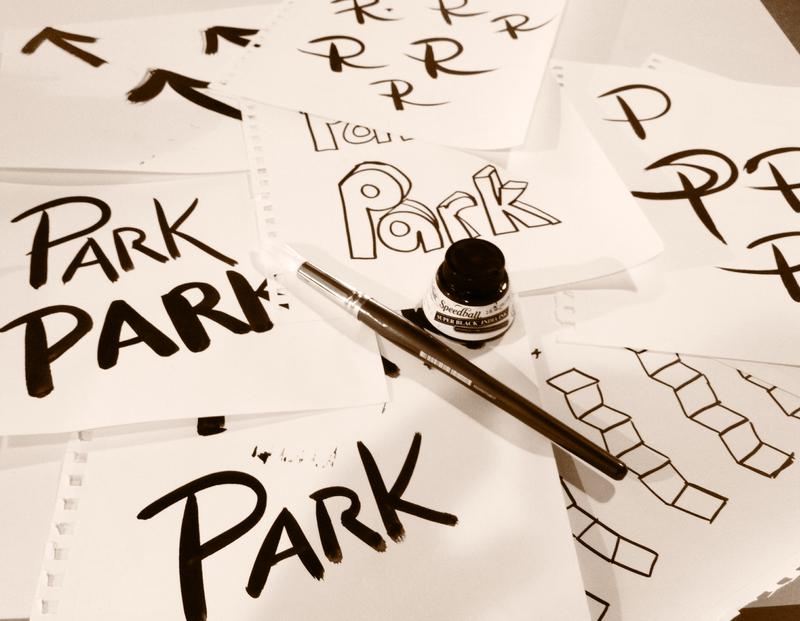 For Park I tried many styles, with letters that were totally script and fluid, until I got to a more cartoonish style. When I think I can get more organic options to a a particular style, I switch to my brushes. I probably filled a whole notebook with 250 pages trying different styles. When I chose the 4 characters I was happy with, I put them together in Photoshop. Retraced them and clean them up. At duopress we focus in publishing books that can’t translate too easy into the digital world. All the hand-held devices and high-tech tablets in the world can’t really compete with the size of a fold-out or a board book. I believe fold-out books are making a comeback. I see more an more coming into the market (That’s great news for Park!) It seems that Fold-Out books are becoming what pop-up books have been for years; a real competition against a world saturated with screens. 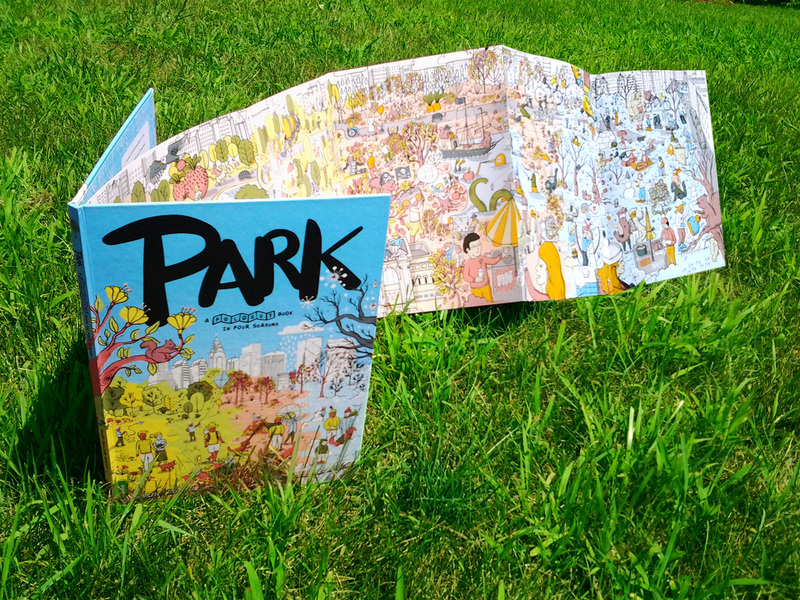 PARK, A Fold-Out Book in Four Seasons (duopress/2014) is available now. Click here to order on-line. Since its inception in 2006, duopress—a small indie book publisher currently based in Baltimore—has been producing award-winning, innovative books and gifts for curious children. duopress specializes in city-specific books and puzzles that reflect the company’s love for kids in a contemporary cosmopolitan style. Visit any US metropolis and you’re bound to see Cool Counting books, Doodle Books, Local Baby books, Foodie books, and puzzles produced by duopress. See them at the publisher’s website, here. Violet Lemay joined the duopress team as an illustrator in 2010 and since then has collaborated on more than twenty duopress projects, eventually becoming the art director in May of 2013. See Violet’s portfolio site, here.